Harrison faces an impossible choice with two swimmers in trouble and only one rescue board. Plus, how will the boys react when international supermodel Heidi Klum visits the lifeguard tower? 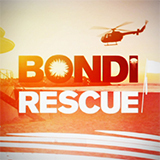 Bondi Rescue was broadcast on Ten at Tuesday 9 April 2019, 19:40.